Wockhardt has posted a 36.99 per cent increase in the net profit at Rs 23.7 crore in the first quarter ended March 31 as compared to Rs 17.3 crore in the same period previous fiscal. Yashwant Sinha today termed the slack season credit policy as “pragmatic” and said there were several good decisions in the policy, including the cut in the cash reserve ratio (CRR). Speaking to newspersons outside Parliament House here, Mr Sinha said the policy was indicative of the RBI’s bias towards a softer interest rate regime. Ranbaxy Laboratories has registered an over 70 per cent increase in its net profit at Rs 9.49 crore for the quarter ended March 31, 2002 as compared to the corresponding period last year. Ruth Handler, who created Barbie, the world's most popular doll, died on Saturday, at the age of 85. 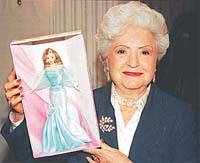 Handler holds a Barbie doll created for the 40th Anniversary party that was held in New York in this February 7, 1999 file photo. The Indian Oil Corporation, Reliance Industries, and Nirma today put in their price bids for acquiring government equity and management control of IPCL. The government is expected to determine the reserve price for selling its 26 per cent equity in petrochemical company on Wednesday and the Inter-Ministerial Group will meet thereafter to evaluate the price bids. A Delhi court today remanded two senior officials of the Reliance Industries group to 14 days judicial custody for alleged violations of the Official Secrets Act after some classified documents were recovered from the corporate office here. The Confederation of Indian Industry (CII) said that it was possible to achieve a 6 per cent growth rate in India if the reforms momentum continues. Speaking newspersons here today after taking over as President of the apex industry association, Mr Asho Soota said that competition will be the key to achieving a growth rate of more than 6 per cent. Ashok Leyland began as Ashok Motors in 1948, assembling Austin cars at its first plant at Ennore, near Chennai. In 1950, it started the assembly of Leyland commercial vehicles and soon local manufacturing under license from British Leyland. The Board of Directors of Philips India Limited (PIL) , Punjab Anand Lamp Industries (PALI), Philips Glass Industries (PGIL) and Electric Lamp Manufacturers (ELMI) today approved amalgamation scheme of PALI, PGIL and ELMI with PIL. The Punjab National Bank has reduced rate of interest on housing loans under floating as well as fixed options effective from May 1, 2002. Mr P.K. Khurana, Zonal Manager of the bank, in a press note released here today, has informed that the rate of interest under its floating option has been reduced to 10.75 per cent per annum from 11.50 per cent on loans repayable upto 5 years; to 11 per cent from 11.50 per cent on loans repayable above 5 years. Bharti Televenture today announced a hefty loss of Rs 112.69 crore during 2001-02 compared to Rs 120.80 crore in the previous financial year mainly due to undertaking various new projects. Hyderabad-based Satyam Computers will recruit 500 people in the next four months to work on embedded software, consulting and packaged software. “We will employ 500 people in the next four months, out of which 100 will be hired for embedded software, 200 for consulting and another 200 will be employed in SAP packaged software”, a company spokesperson said. Om Prakash Chautala said today the Centre had in principle agreed to allot a special economic zone for his state. Addressing members of the Federation of Karnataka Chambers of Commerce and Industry, he said the HSIDC had already identified necessary land to set up the zone and work on providing necessary infrastructure would be taken up within the next few months. Uco Bank crossed the Rs 40,000 crore mark in the last fiscal, it is aiming at reaching a total business of Rs 50,000 crore by the end of March, 2003. Uco’s business grew by 25 per cent in FY 2001-02 compared to 20 per cent during the previous fiscal and 15 per cent the year before. The company has declared a 9.25 per cent dividend on preference shares of Rs 10 each aggregating to Rs 34.2 lakh, Wockhardt said in a release here today. Net sales/income from operations were up 26.9 per cent at Rs 165.3 crore in the period under review as compared to Rs 130.3 crore in the same period last year, it said, adding that on a consolidated basis, including the UK subsidiary Wallis Laboratory, sales grew by 21 per cent to Rs 185 crore. Canfin Homes posted the net profit of Rs 19.81 crore in the year ending March 31, 2002. This was 12 per cent more over last years profit of Rs 17.71 crore. In the last quarter itself Canfin had a net profit of Rs 5.54 crore about 16 per cent more than previous fiscal’s last quarter when the net profit was Rs 4.77 crore. The company had achieved higher profit despite slashing their lending rates twice during the last fiscal. The board of directors has recommended a dividend of 25 per cent as against 23 per cent during the previous year. Cipla Ltd has reported a higher net profit of Rs 617.10 million for the quarter ended March 31, 2002, as compared to Rs 343.60 million for the quarter ended March 31, 2001. The net profit for the year ended March 31, 2002, stood at Rs 2,291.90 million as compared to Rs 1,790.70 million in the corresponding period last fiscal. NIIT today reported a 95.84 per cent fall in its net profit to Rs 2.01 crore in the second quarter ended March 31, 2002 compared to Rs 48.33 crore in the corresponding period last year. The net profit for the six-month period October-March, 2001-02 dipped by 93 per cent to Rs 5.47 crore as against Rs 78.16 crore profit in the same period last year. Crompton Greaves has posted a net profit of Rs 7 lakh for the fourth quarter ended March 31, 2002, down from Rs 13.43 crore during the corresponding period last fiscal. Chemplast Sanmar has posted a 33.13 per cent increase in the net profit at Rs 21.9 crore for the financial year ended March 31 as compared to Rs 16.45 crore in the previous year. Yashwant Sinha today termed the slack season credit policy as “pragmatic” and said there were several good decisions in the policy, including the cut in the cash reserve ratio (CRR). Speaking to newspersons outside Parliament House here, Mr Sinha said the policy was indicative of the RBI’s bias towards a softer interest rate regime. On the bank rate, the rate at which RBI disburses its own funds to commercial banks, the Finance Minister said the central bank would take a decision as and when it was felt necessary. He also said the policy would not have any adverse impact on the government’s borrowing programme. Captains of industry were cautious in welcoming the announcements in the credit policy. “The RBI has acted more in caution that the current low inflationary situation in the country warrants. It has, therefore, decided to postpone the decision on bank rate cut for now, delayed the cut in CRR by three fortnights and reduced the foreign currency export credit by a mere quarter percentage point. But leaving aside the caution the overall slant of the policy is to integrate the Indian banking system with the global economy”, said the President of FICCI. President of Assocham, Mr K.K. Nohria said while the cut in the CRR by 50 basis points was a welcome step, the industry’s expectation for reduction in the bank rate at least by one percentage point and similar in the export rupee credit rate have been belied. Mr Nohria said the current economic situation in the country was characterised by lack of growth in demand, new investment was not picking up and the unemployment rate was rising alarmingly. Referring to the foreign currency loan, Mr Nohria suggested that the RBI to advise/counsel bank to give preferential treatment to some of the sectors in the transition period of three to four years by forgoing complex procedures. President of PHDCCI Arun Kapur said there is a need to further improve the credit delivery system and reduce cost of funds. Mr Kapur said the CRR should have been reduced by one per cent and the RBI should have also given the road map to bring down the CRR to the minimum stipulated level of 3 per cent. Although the net sales of the company registered only 24 per cent growth to Rs 55.29 crore in the first quarter of this year, its export earnings rose nearly 40 per cent to Rs 31.76 crore during the same quarter, a company release said here today. “Significant performances in the USA, Brazil, Europe and Russia led this growth,” the release said, adding that the share of international dosage forms, representing 55 per cent of the global sales, grew 83 per cent. The company, having registered a 39 per cent increase in the net profit at Rs 25.33 crore for the year ended December 31, 2001, has also recommended a dividend of Rs 10. However, there was only a near 8 per cent increase in its earnings to Rs 23.53 crore from the domestic market as compared to figures in the corresponding period of the previous year. Ranbaxy’s expenditure in the first quarter was up by nearly 21 per cent to Rs 45.43 crore mainly due to increase in cost of materials. The Indian Oil Corporation, Reliance Industries, and Nirma today put in their price bids for acquiring government equity and management control of IPCL. The government is expected to determine the reserve price for selling its 26 per cent equity in petrochemical company on Wednesday and the Inter-Ministerial Group will meet thereafter to evaluate the price bids. While IOC officials confirmed the submission of financial bid, a spokesperson of Reliance Industries in Mumbai declined to comment. “We have had discussions with the IOC on joint bidding for IPCL and different modalities and options have been talked about but no decision has been firmed up yet,” ONGC Chairman and Managing Director Subir Raha said. The government, which at present has 59.95 per cent equity in IPCL, has decided to offload 51 per cent stake in two phases. The management control over the company will be transferred to the successful bidder for the 26 per cent stake within the current fiscal and the new partner would have the right of refusal over the remaining 25 per cent equity. The IOC and Reliance are believed to have bid very aggressively for IPCL. For the IOC the acquisition will be an entry into the lucrative petrochemical business and for Reliance the successful bidding will take its market share to unbeatable heights of over 80 per cent. Informed sources said IOC’s bid price will also derive strength from the financial backing that the ONGC has assured. The ONGC has agreed to “collaborate” with it in case it makes the winning IPCL bid. Nirma, the third player in race for IPCL, is also likely to drive a hard bargain as the acquisition will mean integration of its core business, the sources said. IPCL, which had reserves and surplus of Rs 2,946.1 crore as on March 31, 2001, posted a net profit of Rs 56 crore on sales of Rs 3,370.9 crore in the first nine months of 2001-02. Ingersoll Rand India has posted a 27.64 per cent lower net profit at Rs 37.17 crore for the year ended March 31 as compared to Rs 51.37 crore in the previous year. Rejecting the bail applications of group Vice-President A. N. Sethuraman and Corporate Affairs General Manager Shaker Adawal, Chief Metropolitan Magistrate Sangita Dhingra Sehgal remanded them to judicial custody till May 13, CBI Counsel C Sahay told reporters after the court proceedings. V. Balasubramaniam, the third accused in the CBI complaint filed on March 16, was not present at the court as he had been advised bed rest following a brain tumour operation recently in the United States. The entire court proceedings were held in-camera. Immediately after, the two officials were taken into court lockup from where they would be taken into judicial custody. He said as both the Reliance officials were suffering from back ailment, a separate application for supply of medicines in the jail should be allowed. The court also directed the Reliance Counsel N. Natarajan to furnish all medical records of Balasubramaniam. The court had taken cognizance of the CBI compliant on April 5 and had summoned the top Reliance officials today. The two were immediately taken to the court lock-up from where they would be taken into judicial custody. The Confederation of Indian Industry (CII) said that it was possible to achieve a 6 per cent growth rate in India if the reforms momentum continues. Speaking newspersons here today after taking over as President of the apex industry association, Mr Asho Soota said that competition will be the key to acheiving a growth rate of more than 6 per cent. Enhancing competitiveness would mean adopting a two-pronged strategy for competitiveness, he said. The first part of the strategy would be made up of industry action wherein companies would take initiatives to benchmark with best international norms and improve competitiveness. The second part comprised of government action, which would include domestic policy reforms coupled with external sector reforms at the Centre and the level of states, he added. The CII President identified several areas on which the government will have to focus during the current fiscal. On the WTO and global trade issues the government will have to focus on ensuring that the agenda for the Mexico ministerial would be industrial tariff, emphasising on the need for partnership with industry and protecting India’s negotiating position and spreading greater awareness of General Agreement on Trade in Services (GATS), he said. In the area of tax reforms, Mr Soota was of the opinion that the customs duty rationalisation needed to be linked to domestic reforms in labour, state taxes, privatisation and infrastructure. Rationalisation should also remove anomalies to encourage value addition with the country, he added. On financial sector reforms, he said that the government needed to focus on pension reforms as this would benefit the entire financial sector. Pension funds could also mobilise long term funds for the infrastructure sector, he added. Ashok Leyland began as Ashok Motors in 1948, assembling Austin cars at its first plant at Ennore, near Chennai. In 1950, it started the assembly of Leyland commercial vehicles and soon local manufacturing under license from British Leyland. With British Leyland’s participation in the equity capital, in 1954, the company was rechristened Ashok Leyland. Recently, the ALL stock has been in the limelight after the Supreme Court declined to grant any further extension of deadline for conversion of diesel buses to the compressed natural gas (CNG) mode in Delhi. Since ALL is a major supplier of CNG buses in Delhi and has a market share of over 50 per cent, the decision of the Supreme Court in favour of CNG buses may result in a huge spurt in the company’s sales volumes. This may help improve the company’s bottomline. Besides, better numbers at the end of the latest quarter is expected to keep sentiments high on the counter. Also, foray into light commercial vehicles (LCV)s will be a tough task and inter-group investments remain in cause for concern. The stock has the potential to provide handsome gains in the medium-to long-term, making it worthwhile to buy the stock. Pidilite aims at expanding across three business segments — adhesives and sealants, construction/paint chemicals, and art material. Fevicol could easily qualify as a case study of whether the brand is bigger than the company. This is an issue that the company is well aware of — and it is trying hard to overcome its dependence on its cash cow. In fact, over the years, Pidilite has expanded its brand portfolio, which gives it an edge over competitors in pricing and helped it reduce the risk of being a single-product company. Besides, Pidilite’s profits are back on the growth path, rising 20 per cent in the December quarter. A pick-up in economic activity will add momentum. Also, direct communication channel with target audience (carpenters, architects, households), giving guidance and education about usage of products has been behind the success of Pidilite even during times of lull in construction activity. Consistent high quality of products, high brand recall rate, width and depth of product range coupled with wide marketing network provide distinction in market place will be hard to replicate. More importantly, Pidilite acquired Ranipal and M-Seal at two times valuation. Currently, Pidilite is trading at around 0.75 per cent of sales. That gives an indication of what the private market value of some of those brand are. Considering its valuations and growth prospects, we feel that the market will value the stock fairly, going forward. Till a few years ago, Indo Gulf was a one-product company: fertilisers, a highly regulated business. This changed in 1997, when it forayed into the relatively more lucrative copper business. In fact, in terms of sales, copper became Indo Gulf’s primary business the same year — its contribution to revenues has risen from 53 per cent in fiscal 1999 to 77 per cent in fiscal 2001. As a result, the fertiliser division’s contribution to revenues has fallen from 47 per cent to 23 per cent over the same period. The copper business, which is seeing an upturn, will be Indo Gulf’s chief growth driver in the coming years. Indo Gulf has successfully forayed into the export market for growth. In the global copper market, Asian countries (particularly China) are the fastest growing due to considerable infrastructure spending towards power and telecommunications. Notwithstanding the constraints, the fertiliser sector’s growth has been estimated at 6 per cent annually, riding on the back of successive good monsoons. Given the current valuations, Indo Gulf looks a very good buy. According to company release, the scheme envisages a share exchange ratio of 10 equity shares of PALI for every 11 equity shares of PIL and seven equity shares of PGIL for every one share of PIL. As ELMI is a wholly owned subsidiary of PIL, the scheme envisages cancellation of PIL’s shareholding in ELMI. The share exchange ratio was based upon the recommendations made by SB Billimoria and Company and NM Raiji and Company, Chartered Accountants who acted as independent valuers to the transaction. DSP Merril Lynch acted as financial adviser to the transaction. Mr K Ramachandran, MD, PIL, said the merger, which is intended to place the lighting business under single Philips entity, will integrate the operations which are currently in four legal entities and is aimed at improving efficiencies across the supply chain. The Punjab National Bank has reduced rate of interest on housing loans under floating as well as fixed options effective from May 1, 2002. Mr P.K. Khurana, Zonal Manager of the bank, in a press note released here today, has informed that the rate of interest under its floating option has been reduced to 10.75 per cent per annum from 11.50 per cent on loans repayable upto 5 years; to 11 per cent from 11.50 per cent on loans repayable above 5 years. The rate of interest has been slashed from 12.5 per cent to 12 per cent for loans up to 20 year, and above 20 year and upto 25 years period. Mr Khurana said under the fixed option, the rate of interest has also been reduced to as low as 11 per cent pe annum from 11.25 per cent for loans repayable up to 5 years. However, there is no change in rate of interest for loans above 5 years and up to 20 years, which will remain at 12 per cent per annum, and for loans above 20 years and up to 25 years, which would be 13.5 per cent per annum. Bharti Televentures, which raised over Rs 830 crore recently through its maiden public offering of 18.5 crore shares, however, registered a cash profit of Rs 294.82 crore compared to Rs 97.14 crore during the period under consideration. But cash profit during the last quarter (January-March) of 2001-02 dipped by 30 per cent to Rs 54.78 crore as against Rs 78.28 crore in the corresponding period last year. Hyderabad-based Satyam Computers will recruit 500 people in the next four months to work on embedded software, consulting and packaged software. “We will employ 500 people in the next four months, out of which 100 will be hired for embedded software, 200 for consulting and another 200 will be employed in SAP packaged software”, a company spokesperson said. The company is looking at packaged software segment to move up the value chain. Om Prakash Chautala said today the Centre had in principle agreed to allot a special economic zone for his state. Addressing members of the Federation of Karnataka Chambers of Commerce and Industry, he said the HSIDC had already identified necessary land to set up the zone and work on providing necessary infrastructure would be taken up within the next few months. Mr Chautala, who is here to woo investors from Karnataka, said his state was devoid of communal tension and all necessary infrastructure was available. It was developing a cyber city and a media city in a big way and the export of software had already crossed Rs 3,000 crore. Uco Bank crossed the Rs 40,000 crore mark in the last fiscal, it is aiming at reaching a total business of Rs 50,000 crore by the end of March, 2003. Uco’s business grew by 25 per cent in FY 2001-02 compared to 20 per cent during the previous fiscal and 15 per cent the year before. Its market share increased to 2.2 per cent during 2001-02 from 1.94 per cent a year ago by adding more than Rs 8,000 crore as new business during the year. The bank has also met the national target of 40 per cent in priority sector credit. It is likely to post a sizeable Operating Profit of more than Rs 400 crore and a three digit net profit in the FY 2001-02. Uco made Rs 214 crore of operating profit and Rs 33 crore of net profit in the FY 2000-01. The bank now plans to go for an IPO in the year 2003.